The purpose of this study was to investigate the technological and pedagogical constructs underlying Turkish preservice teachers’ behavioral intentions to use interactive whiteboard based on UTAUT model and TPACK using three structural equation models; technological framework, pedagogical framework, and integrated model. Within this scope, preservice teachers’ behavioral intentions to use IWB was defined as the dependent variable. Performance expectancy, effort expectancy, IWB self-efficacy, and technological knowledge were technological independent variables while individual innovativeness, technological pedagogical knowledge, pedagogical knowledge, and constructive and traditional teaching beliefs were pedagogical independent variables. Nine hypotheses were formulated based on the causal relationships between behavioral intentions to use IWB and independent variables. The proposed model was tested through SEM based on maximum likelihood estimation method using LISREL v.8.71 software. The significance of X2, the ratio of X2/df and other goodness of fit indices were used in the evaluation of the models’ fit. For hypothesis tests, path coefficients (β) and t values for each hypothesis were used. The findings showed that performance expectancy and technological pedagogical knowledge were the variables that significantly influenced the behavioral intention to use IWB in technological and pedagogical frameworks, respectively. Moreover, performance expectancy was the sole variable that significantly and positively influenced the preservice teachers’ behavioral intentions to use IWB in the integrated model. The main conclusion of this study was the revelation of teachers’ beliefs that IWB use would help them be better teachers by improving their performance independent from all other variables examined in the study. A piece of this study was presented in International Educational Technology Symposium in Sivas, Turkey between 27 and 28 October, 2017. Ibieta, A., Hinostroza, E., Labbe, C., & Claro, M. (2017). 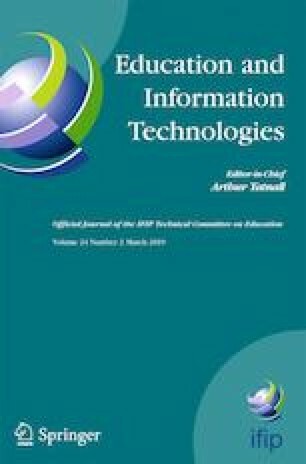 The role of the Internet in teachers’ professional practice: activities and factors associated with teacher use of ICT inside and outside the classroom. Technology, Pedagogy and Education, 1–14. https://doi.org/10.1080/1475939X.2017.1296489. MONE. (2017). FATIH Project. About Fatih Project: http://fatihprojesi.meb.gov.tr/en/?page_id=10. Accessed 3 Sept 2018. Sanders, M., & George, A. (2017). Viewing the changing world of educational technology from a different perspective: Present realities, past lessons, and future possibilities. Education and Information Technologies, 1–19. https://doi.org/10.1007/s10639-017-9604-3.